رضایی نایه, علی, شمالی, ظاهر حسین, حاتمی, محمدرضا. (1392). بررسی روش برگردان نسبی تانسور گشتاور لرزه‌ای با استفاده از داده‌های شبیه‌سازی شده و کاربرد آن در پس‌لرزه‌‌‌های زمین‌لرزه‌ 28 فوریه 2006 فاریاب 0/6=Mw. مجله ژئوفیزیک ایران, 7(1), 51-63. علی رضایی نایه; ظاهر حسین شمالی; محمدرضا حاتمی. "بررسی روش برگردان نسبی تانسور گشتاور لرزه‌ای با استفاده از داده‌های شبیه‌سازی شده و کاربرد آن در پس‌لرزه‌‌‌های زمین‌لرزه‌ 28 فوریه 2006 فاریاب 0/6=Mw". 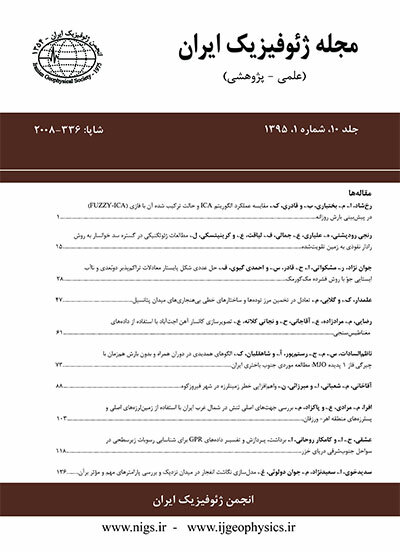 مجله ژئوفیزیک ایران, 7, 1, 1392, 51-63. رضایی نایه, علی, شمالی, ظاهر حسین, حاتمی, محمدرضا. (1392). 'بررسی روش برگردان نسبی تانسور گشتاور لرزه‌ای با استفاده از داده‌های شبیه‌سازی شده و کاربرد آن در پس‌لرزه‌‌‌های زمین‌لرزه‌ 28 فوریه 2006 فاریاب 0/6=Mw', مجله ژئوفیزیک ایران, 7(1), pp. 51-63. رضایی نایه, علی, شمالی, ظاهر حسین, حاتمی, محمدرضا. بررسی روش برگردان نسبی تانسور گشتاور لرزه‌ای با استفاده از داده‌های شبیه‌سازی شده و کاربرد آن در پس‌لرزه‌‌‌های زمین‌لرزه‌ 28 فوریه 2006 فاریاب 0/6=Mw. مجله ژئوفیزیک ایران, 1392; 7(1): 51-63. برگردان نسبی تانسور گشتاور لرزه‌ای روش سریع و مناسبی برای تعیین سازوکار زمین‌لرزه‌هایی است که نزدیک به هم رخ می‌دهند و در ایستگاه‌های مشترکی ثبت شده‌اند. در این روش با استفاده از اندازه‌گیری نسبی دامنه یک فاز خاص ناشی از چندین زمین‌لرزه‌ای که نزدیک به هم رخ داده‌اند و در ایستگاه‌های مشترک ثبت شده‌اند می‌توان با داشتن سازوکار زمین‌لرزه مرجع، بدون دانستن تابع گرین کامل سازوکار زمین‌لرزه‌های دیگر را به دست آورد. در این تحقیق سعی شد تا با تولید داده‌های مصنوعی تحت شرایط متفاوت و برگردان آنها به روش نسبی، تاثیر عوامل گوناگون همچون مقدار درصد CLVD (مقدار سهم مولفه غیر دوزوج نیرو) و همچنین تاثیر مدل سرعتی پوسته در نتیجه برگردان نسبی بررسی شود. مکان زمین‌لرزه‌هایی که در این تحقیق شبیه‌سازی شده‌اند مطابق با مکان زمین‌لرزه 25 مارس 2006 منطقه فین و 13 پس‌لرزه آن است که با استفاده از شبکه نوار پهن پژوهشگاه بین‌المللی زلزله‌شناسی و مهندسی زلزله (INSN) ثبت شده‌اند. بزرگی این زمین‌لرزه‌ها برحسب ML بین 5/3 تا 6/5 متغیر است. در این تحقیق چهار سری داده مصنوعی برای این 14 رخداد تولید شده است که تفاوت آنها در مقدار درصد دوزوج نیرو و همچنین مدل پوسته‌ای مورد استفاده است. با عمل برگردان برای این چهار سری داده مصنوعی این نتیجه حاصل شد که روش برگردان نسبی تانسور گشتاور برای تعیین سازوکار زمین‌لرزه‌هایی که در مقیاس محلی نزدیک به هم رخ داده‌اند (زمین‌لرزه‌های خوشه‌ای) مناسب است، همچنین نتایج نشان می‌دهد که افزایش غیرمنطقی و بیش‌ازحد مؤلفه غیر دوزوج نیرو در داده‌ها، باعث بروز خطا در این روش می‌شود؛ بااین‌حال تغییر نوع مدل پوسته‌ای به کار رفته در تولید داده‌ها، باعث به‌دست آمدن خطای قابل‌ملاحظه‌ای نمی‌شود و اثر مدل پوسته‌ای در برگردان نسبی کمینه می‌شود. با کمک این روش، سازوکار پس لرزه‌های زمین‌لرزه 28 فوریه 2006 فاریاب تعیین شده است. سازوکار های به‌دست آمده با روند کلی زمین‌لرزه اصلی تطابق دارند. Relative Moment Tensor Inversion, RMTI, method is a suitable method to determine the focal mechanism of some close-lying earthquakes (a cluster of earthquakes) recorded by common seismic stations. With enough data on the propagation path, a Green's function is needed in classical source studies. However, the effect of the propagation path is minimized in RMTI applications using relative data. The observed data in an RMTI method consists of the relative amplitudes of the direct P phase and direct S phase on vertical and rotated horizontal components of some close-lying earthquakes recorded by common seismic stations. The effect of the propagation paths from the source-region to a given seismic station is minimized using the relative amplitudes of the corresponding phases (e.g. P-phase) at a given station. The focal mechanisms of the earthquakes are then determined using a linear weighted least-squares approach for the six components of the seismic moment tensor without knowing the complete Green's functions. The calculation is done using only a simple velocity model at the source region. In this research, we have implemented the RMTI method for four groups of synthetic data. Each group consists of 14 events that their corresponding locations and focal-mechanisms are taken according to the events of March 25, 2006 occurred in the Fin region, South of Iran. These events were recorded by Iranian National Broad-Band Seismic Network (INSN) in local distances and their magnitudes (ML) vary between 3.5 and 5.6. In this synthetic data-set, we tried to analyze the effect of a velocity-model and also non-double couple components (CLVD) in the moment tensor inversion using different scenarios. The synthetic data were firstly inverted using a classical moment tensor inversion in a time domain and then were inverted using the RMTI method in both time and frequency domains. The effects of the velocity model and CLVD components in the data were then analyzed using the synthetic data at different frequency bands used in the inverse algorithm. Our results indicate that the RMTI method can be easily implemented to retrieve the focal mechanism of close-lying earthquakes in local distances. Our results also indicate that an unrealistic increase of non-double-couple components causes wrong results, but the crustal model does not cause any significant effect and the effect of the propagation path in a relative inversion is minimized. The aftershock focal mechanisms of the February 28, 2006 earthquake were determined using an RMTI method. The focal mechanisms of the aftershocks were consistent with main shock. Bouchon, M., 1981, A simple method to calculate Green's functions for elastic layered media: Bull. Seism. Soc. Am., 71)4(,959-971. Dahm, T., 1996, Relative moment tensor inversion based on ray-theory: theory and synthetic tests: Geophys. J. Int. 124, 245–257. Dziewonski, A. M., Chou, T. A., and Woodhouse, J. H., 1981, Determination of earthquake source parameters from waveform data for studies of global and regional seismicity: J. Geophys. Res., 86, 2825-52. Gilbert, F., and Dziewonski, A. M., 1975, An application of normal mode theory to the retrieval of structural parameters and source mechanisms from seismic spectra: Phil. Trans. R. Soc. A 274, 369- 71. Hatzfeld, D., Tatar, M., Priestley, K., and Ghafory-Ashtyany, M., 2003, Seismological constraints on the crustal structure beneath the Zagros mountain belt (Iran): Geophys. J. Int., 155, 403-410. Incorporated Research Institutions for Seismology (IRIS), http://www.iris.edu. International Institute of Seismology and Earthquake Engineering (IIEES), http://www.iiees.ac.ir. Kanamori, H., and Given, J. W., 1981, Use of long period surface waves for rapid determination of earthquake source parameters: Phys. Earth Planet. In. 27, 8-31. Kennett, B. L. N., and Engdahl, E. R., 1991, Traveltimes for global earthquake location and phase identification: Geophysical Journal International, 122, 429–465. Langston, C. A., and HeImberger, D. V., 1975, A procedure for modelling shallow dislocation sources: Geophys. J. R. Astr. Soc. 42, 117- 30. Lay, T., and Wallace, T. C., 1995, Modern Global Seismology: Academic Press, New York. Mendiguren, J. A., 1977, Inversion of surface wave data in source mechanism studies: J. Geophys. Res., 82, 889-94. Sokos, E., Zahradník, J., 2008, ISOLA a Fortran code and a Matlab GUI to perform multiple-point source inversion of seismic data: Computers and Geosciences, 34, 967-977. Strelitz, R. A., 1978, Moment tensor inversions and source models: Geophys. J. Roy. Astron. Soc., 52, 359-64. Stump, B. W., and Johnson, L. R., 1977, The determination of source properties by the linear inversion of seismograms, Bull. Seism. Soc. Am., 67, 1489-502. Zahradnik, J., Jansky, J., and Papatsimpa, N., 2001, Focal mechanisms of weak earthquakes from amplitude spectra and polarities: Pure Appl. Geophys., 158, 647-665.